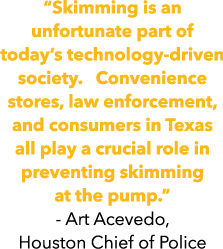 The Texas Food & Fuel Association, a statewide organization representing the convenience store and fuel marketing industries in Texas, will host a 2-hour seminar focused on combating credit card skimming at the pump. Fuel dispensers are one of many targets for sophisticated and aggressive thieves attempting to steal customers’ credit and debit card information. Learn how convenience store operators and law enforcement can work together to identify and defend against credit card skimming by registering for an upcoming seminar. The seminar is open to convenience retailers, fuel marketers, industry suppliers, law enforcement, financial institutions, state agencies, and all others who have a vested interest in protecting consumer data and advancing the convenience store industry in Texas. If you cannot participate in person, or are in need of additional resources, visit www.SkimmingPrevention.org. For registration or media inquiries contact Jesus Azanza, Director of Marketing & Business Development, jazanza@tffa.com or 512.617.4309.